As expected, the number of high end homes sold through May 2014 has fallen sharply over the same time last year. 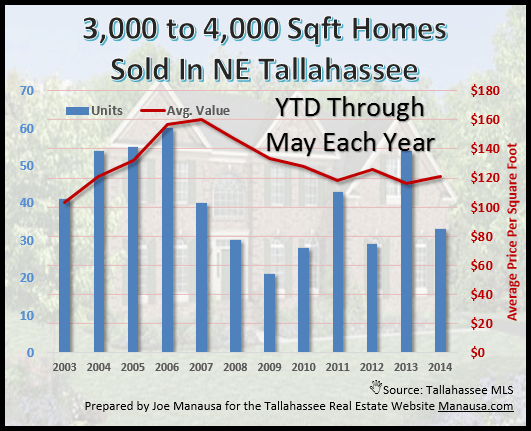 Low interest rates have buoyed the upper end of the Tallahassee real estate market for several years, but the slow rise in rates at the onset of 2014 greatly diminished the pool of buyers who could afford homes priced over $500,000. Today's report contains critical market intelligence for people who need to sell a home priced near the top of the Tallahassee housing market. Our first real estate graph shows that values for each sector of our upper end of the real estate market in Tallahassee are on the decline. This is contrary to much of the rest of the market which is showing stable or rising values. In the real estate graph above, we see the number of homes sold each year shown as vertical bars and measured on the left vertical axis, and we see the average value shown as horizontal lines and measured on the right vertical axis (measured in average price per square foot). Homes priced between $500,000 and $750,000 are shown in blue, homes priced above $750K are shown in red, while both combined are shown in green. We see that values of homes between $500K and $750K are pretty much the same as last year (the lowest on record going back more than 12 years), while homes above $750K are even lower than last year. Another way to get a feel for high end homes in Tallahassee is to take a snapshot by home size. Most of the luxury homes in Tallahassee are larger, measuring 3,000 square feet and larger. By isolating a singular, large size range, we get additional insight into what is currently transpiring at the top of our housing market. Here, we see that the average price per square foot of this "size range" is slightly higher than last year, but unit sales have decreased by 39%. I suspect this means sellers holding out for their price are being ignored for the most part, thus buyer activity is on the decline. People who need to sell a 3,000 square foot home should ensure they understand supply and demand for homes like theirs, in their niche market area in order to ensure they get the attention needed to procure a sale. The following list of homes for sale are the most-recently listed homes in the upper end of the Tallahassee real estate market. 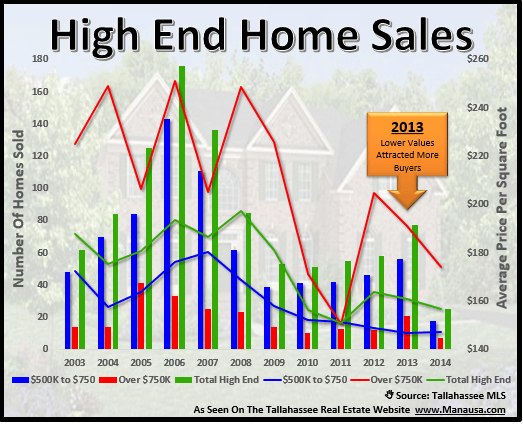 I hope this report has helped you gain a better understanding of the high end homes market in Tallahassee. If you are interest in buying or selling a home in Tallahassee, just drop me a note and we'll be in touch right away to set a time to review your needs and wants.